Tula has been making ammunition in Russia since 1880, which makes them one of the oldest cartridge companies in the world. They switched from brass to steel in the 1920s to preserve the country's resources, and really haven't looked back since. One thing the Russians really know how to make is 7.62x39 ammo, which might have something to do with the fact that they invented the cartridge. I had a chance to shoot a fair amount of Tula 7.62x39 ammo recently, and I was pretty pleased with what I found. This particular load has a 122 grain, full metal jacket bullet. The jacket is bimetal, meaning it is made of copper and mild steel, so it will attract a magnet. However, the steel barrel of your rifle is much harder than the steel in the jacket of the bullet, so it won't cause any damage or excess wear. The core of the bullet is lead, and it's important to note that this is not armor piercing ammunition. At the range, I found that this Tula ammo functioned perfectly in a number of different rifles, from AKs to SKS's. I was a little disappointed with its accuracy out of the SKS, but I don't think many people are going to buy this ammo for bench rest shooting anyway. It was loaded to a decently high velocity, though. Tula 762 by 39 is affordable and reliable, and I'd say it's a pretty good choice for range use or plinking. Excellent practice ammo, good value, and consistent in groupings. Very good value for practice ammo as it seems consistent. Today I fired 240 rounds of this ammo on the range, freehand, split even between the 100 yd and 200 yd stations. There were no misfires or duds. Patterning was consistent with the last five sessions. Gun utilized is an AK-variant with 20" chromium barrel. Thanks "Luckygunner" I appreciate your great website and your quality products. My brother said this Tula ammo is the most accurate of the three brands he's shot through his rifle, so I bought some for him for his birthday. He's happy. I've shot plenty of Tula and never an issue. Thanks LG! I have shot about 350 rounds of this ammo thru my Sig 556xi Russian and each time I shoot it I have had issues. At first I thought it might be an issue with the gun but I have shot 500rds of another 7.62x39 ammo without a single issue. 1st was about one in every box (20) has a delay when trigger pulled and when it goes "bang" (I checked the strike on the spent cases and each one is centered and deep so no issue with light strike), the delay isn't real long but long enough to notice. The last 50 rds I shot it didn't seem to happen as much but I had a much bigger issue. The 2nd issue was far more concerning, I had a round chambered it didn't go "bang" and after waiting a bit, just in case, when I ejected the round the bullet came out of the case inside the barrel (leaving powder all over the inside of the chamber). I didn't notice it right away and luckily the bullet was stuck in the barrel at a point to not allow another round to chamber. 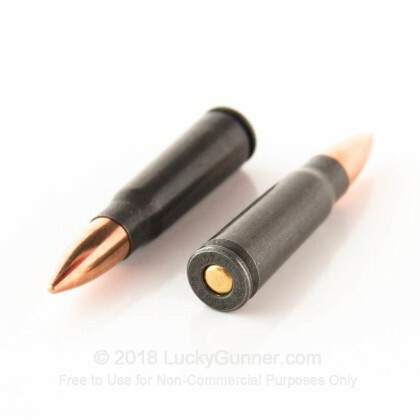 if the bullet had been further in the barrel there is a good chance that the second round would have have loaded and fired (might have caused a barrel failure). As a precaution, I had the gun checked out at the Sig Sauer Factory and everything is good to go no issues with the gun. I keep my guns well cleaned and I have only used FrogLube on all of my firearms (which have never had any issues at all). Overall I am not real happy with this ammo and will not be using it (I still have about 600 rounds left but there is no way I am risking it). Great ammo for the price fires every time! I have shot over 1000 rounds of this stuff through my AR15, SKS, and AK47. The only issue I ever have with it is an occasional dud, mostly in the AR15. By occasional I mean something like 1 dud per 60 bang. This ammo is surprisingly accurate for cheap ammo, I get an occasional flyer but good 3-4" groups average. I would recommend this ammo. Great cartridge for a CZ 527 Carbine! 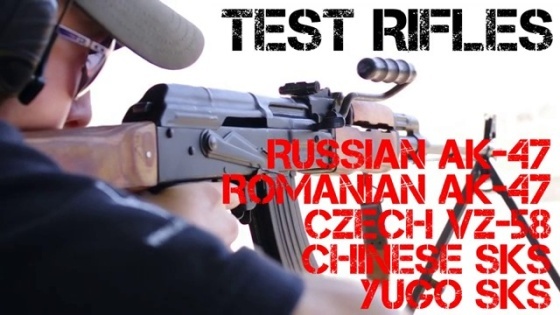 So far, I have shot 120 rounds of the Tula 7.62x39 through my new CZ 527 carbine without a single failure. The Tula rounds work flawlessly in this bolt action rifle and I was surprised at how consistent my groupings were, especially since this was my first time on the range with the CZ 527. At the end of the day, cleaning was a breeze, so I'm very happy to recommend both Tula and the CZ carbine to other lucky gunners. This ammo did exactly what I wanted it to do. There is no reason to buy other brands for me. I'm completely satisfied with my purchase and will be buying more as soon as I need to. Good Ammo at the Cheapest Price! Ammo is priced fair and shipped fast, received it in 3 days business days. This ammo works great in the Sig 556R, would recommend this ammo to anyone without hesitation. I am also a dealer, and buy some of my ammo here due to the cost, some of Lucky Gunner ammo is cheaper than my wholesale prices. Always get my ammo fast, I'm usually surprised because it comes before expected. No backorders & no waiting! Been buying from Luckygunner for several years now and have never been dissatisfied. My order was on time, ammo was in stock, shoots just fine. I will order again soon, in the past had good experiences ordering with Lucky Gunner. Quality product and fast service! Excellent job! The ammo arrived in just two days and was packaged perfectly! This ammo works great for dumping through an AK. Nothing special here, but it's extremely affordable and my Yugoslavian N-PAP feeds it with no issues. ease of ordering, and came very quick to my doorstep. Bought 1000 rounds of 9. Used half box. Only one missfire. Possibly because of new weapon. Very satisfied. Fired around 300 rounds of this ammo through a Norinco SKS with no problems. The ammo has incredible accuracy and is very clean. As always lucky gunner is the best place to get ammo from. Fast delivery and reliable. Enjoy the very best at the cheapest price! Can't say enough about Luck Gunner. They're hands down the best in the business and absolutely NO ONE ships faster. Now for Tulammo. Like my brothers and sisters in arms have said, this ammo is without flaw. This is as close to getting something for nothing as you're going to get boys and girls. Believe it! Enjoy shooting for as long as you dare with no problems. SHOOT 'EM IF YOU GOT 'EM! Thunder Struck! Great ammo, great price, and it showed up in about 3 days. That's the only thing I'm complaining about. My shoulder hates me. But I'm smiling. Priced good just a little dirty but not too bad. Love it and lucky gunner is always a pleasure to do business with! Went out with my brand new ak and put 100 rounds through it with out a single miss fire. Great ammo. Shipping was very quick. The ammo was all in good shape and box was undamaged. The cartridges performed very nicely, no misfires and accuracy was great! I will use Lucky Gunner again for Ammo orders and will refer Lucky Gunner to my friends! Awesome aammunition! Got it for my AK, great ak food. Ammo works great.No jams, no misfired, smooth ejection..
First off Lucky Gunner was great, shipped very fast and was a great price. I shot 400 rds on a recent outing with no ftf or any other issues. Using an M&M m10 ak and an Eotech 512 at 50 yrds I shot a 2in group. I only had 2 flyers out of 400, I would call that pretty good odds on hitting the 10. 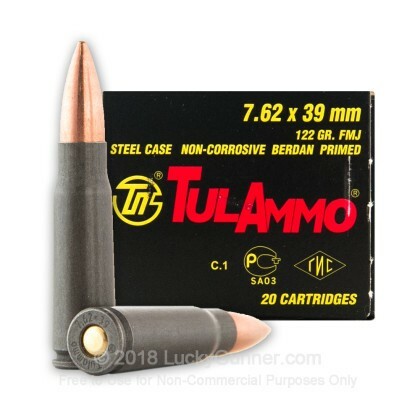 I read alot of reviews before I ordered Tula and alot of them were mixed but after shooting it I have confidence in their ammo and will buy it again. Great ammo for a great price. attended local gun and knife show past weekend . looking for best deal on ammo 7.62+39 . luckygunners prices even with shipping beat 3 different dealers prices . first time shopper but I WILL BE BACK !!!!! Very fast shipping. Ammo was delivered within a couple of days. Not one misfire. No hassle purchase. I will definitely be using Lucky Gunner for future ammo purchases. The quality of this Russian ammo is very good. No failures at all, out of almost 7,000 rounds. Accurate, too. I will definitely be buying more. Great website & I will be using it again. The ammo came in just a few days. It's a great product & I have recommended your site to others. I find this ammo reliable and at a great price. Took SKS out and no problems and no jambs nor miss fires. Did have to but lg plastic container to store it in here in FL. and used a damp rid container inside to keep fresh and dry. Excellent co. I've bought thousands of rounds from lucky Gunner. Shipping was fast, Ammo was quality, and purchases secure. You will have my buisness for life. Lucky Gunner provides the fastest service around. Plan to make this my go to site! I found what I was looking for easy and my order was shipped fast. Excellent service from Lucky Gunner. I have been shooting Tula ammo in all my 7.62 rifle's. I am very satisfied. The ammo is clean and I have never had a misfire. Lucky Gunner has the best prices, reasonable shipping charges, and fast delivery. Great job guys. you aren't going to beat this ammo for the price. accurate, reliable and ships as fast as it shoots. LG does it again!!!! Great site for the most part, i dont shop anywhere else for ammo! The live feed stock numbers are perfect. Will do business again in future. This is great ammo! Picked up this 1000 rounds a few months ago, and is well worth it! Have fired a few hundred rounds of this in my Arsenal forged AK with ZERO problems! Ordered Tuesday...got my shipment Friday afternoon. Excellent price for bulk ammo!!! About to order again. Great ammo , no failures. Sure beats expensive 223 . Decent ammo-I've had ok luck with the 9mm variety as well. For the money, this is good ammo-has been very reliable so far. Purchase price is decent, I think it could be a bit better for the type of ammo that this is though. Best price online and super fast shipping! Great ammo for my sks. Ran 250 rounds through my gun no problems! Russian loves Russian. You can't go wrong at his price. My old SKS loves these rounds. TulAmmo and AKs go together like bread and butter (or whatever the Russian equivalent is). They're made for each other. I've fed my AK a steady diet of TulAmmo and have had no problems whatsoever. Highly recommended. Lucky Gunner, what can I say? Your prices and service are amazing! Keep it up and you'll keep my business. Fast delivery of a very good and dependable product. Awesome service and awesome pricing!! Ammo was also in stock and arrived very quickly couldn't be happier with the experience! What can I say...I cannot get enough of this ammo!!! Flawless range time with it out of my WASR-10, no issues and packs the punch!!! Shipping was Lightning Fast and Excellent Value. I recently purchased 1000 rnds of 7.62 X 39mm. It was my first purchase from Lucky Gunner. The shipment was delivered sooner than I thought it would take. I have fired several hundred rounds with no misfires or jams. 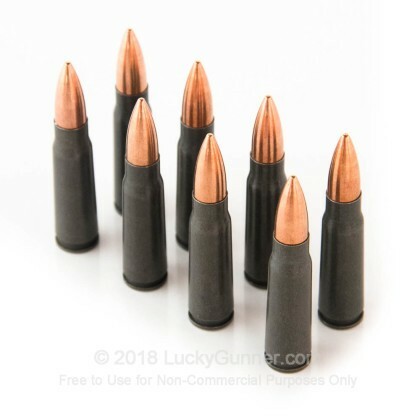 I will be ordering more ammo from Lucky Gunner and I have recommended them to my friends. Very pleased with the ammo - flawless function in Romy AK. Clean burning propellant. Shipping was very quick. Luckygunner offers an outstanding value and service. I will continue to buy ammo from Luckygunner. Have not had this much fun in a long time. AK just eats this stuff up. Have ordered 5,000 rounds so far. On my doorstep in 2 days, that is excellent service. Will be ordering when I am running low. The way this stuff shots that will be very soon!!!! Had tons of fun with these down at the river. No misfires, solid round. Had a shooting competition with a buddy shooting a .223 at oranges. While the .223 was more accurate, the 7.62 showed that dumb fruit who was boss. Great service, will be buying agian. Fast service, great prices, easy to navigate instock website, need I say more. Will definitly buy more soon, real soon. Of the many imported ammo options this one is the most consistent in all my AK variants. I have had no issues to date and will by more when needed. As a resident of anti Second Amendment Illinois, this caliber is tough to find and very hard to find at such a great price. Shot 200 rounds through my WASR-10 without any issues at all. Very clean and accurate. Would buy again for sure. Thank you Lucky Gunner! Service was great, order arrived in 3 days. Ammo was fine. Tula ammo while maybe not the greatest, is always consitent. I just recently bought a Bulgarian made arsenal ak47 and was eager to get a chance to put some rounds through it. I started shopping around online and luckygunner.com had the best prices all around. I've fired a little over half of my first thousand rounds an not one failure. I'll dedinately be coming back for more. Lucky Gunner had the best price on this ammo and the customer service was outstanding as always. My Yugo SKS 59/66 runs great with this ammo- first 100 rounds with not one failure to feed/fire/extract/eject. Rested groups at 50 yards were around an inch to two inches- more than respectable for this type of ammo. I highly recommend it. I bought these as a gift... I have no real knowledge of performance, value, or quality to be honest. However, I will comment on the service and delivery. I ordered this for a Christmas gift and needed it fast... it arrived within a few days without having to pay extra for rush delivery. I would surely order from Lucky Gunner in the future just for their great customer service! Seem to be very high quality. Shot my first 60 rounds. Everything I expected and more. GREAT value, incredible service and great rounds. I wont shop any where else and Lucky Gunner is the only recommendation for my friends. Customer service is "Off The Scale" I screwed up and entered my billing address as the shipping address and didn't realize until the following day. 1 phone call and Lucky Gunner took care of it. No more shopping around for me when I buy ammo after service like that. Very good ammo at a very good price, I couldn't believe how fast the shipping was, would buy again. My first purchase here and I was extremely pleased with the quickness in shipping and the product is fantastic especially the price. No need to look any further than here for ammo! I had tight groups at both 25 and 50 yards with no problem. Also, the ammo seemed cleaner. I will purchase it again and will probably stick with this brand. Great quality, performance and another great transaction with Lucky Gunner. 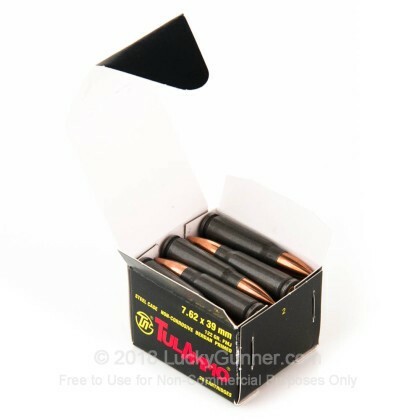 good price fast shipping this is the best place to buy ammo that i have found. Best source for 7.62 ammo! I stumbled across this site on accident when I was trying to find bulk 7.62 ammo. I was pleasantly shocked to see the price, low shipping costs and expedited shipping times! I will DEFINITELY buy again and alot more ammo!!! For cheap practice ammo I am impressed. I expected this ammo to be dirty but that was not the case at all. No failures at all in my AK-47 after 500 rounds with this ammo. Great price, good performance, pleasant experience ordering and very quick service. The what you see is available aspect of the website is very good. No guessing if the product is in stock. Best Ammo supplier I have found to date. The price + shipping is hard to beat, especially as the order size goes up.The speed that the shipment arrived surprised me. Lucky Gunner kept me informed every step of the way. Lucky Gunner WANTS you to be happy! I have bought 2000 rds of this ammo and it is super! Great product and prices, I bought 850 rounds for my 45 and sks they arrived in just a couple days. Awesome product lines and great prices. I will be back soon, im checking your site every couple days looking at your specials. Good stuff, 3" group at 50yds 5" group at 100yd on crude rest. 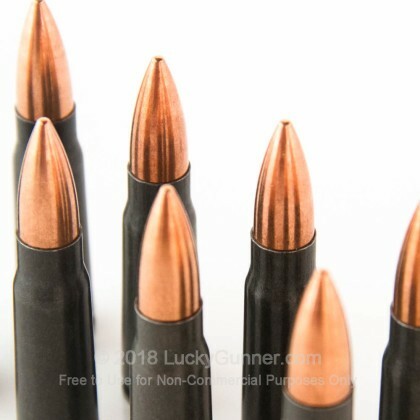 Primers set deeper than most other surplus for 7.62x39-if fired cases have a deep firing pin dent reliability isnt an issue. Great ammo for the combination of price, quantity, and quality. Can't believe the delivery truck pulled in my drive that soon after I placed my order. I'm very pleased with how smooth the transaction went , will be back again soon. Very happy with my total experience with Lucky Gunner. Busted 6 30 round clips no problems. The best deal I could find. Although others offer a slightly lower price per round, the shipping kills you. LuckGunner had the best price with shipping that I could find. You will see me again. Q: I know that if you Tula out of an AR-15 that it will wear out the riffling MUCH faster than brass cased ammo. Will this have the same effect on an AK or SKS? Q: Is it the demond corrosive power type? A: Tula ammunition states that all of their products are loaded with non corrosive powder and primers. Our tests have found this claim to be true and unable to see any evidence of corrosion weeks after firing prior to cleaning. Q: What do the boxes of ammo come stored in? A: This Tula ammunition ships in the factory cardboard case. The cartridges are then packaged in smaller boxes of 20. This material is slightly thicker than stock card material which is then coated for extra strength and protection. Inside these boxes of 20, they are stacked 4 rounds deep, 5 across, separated by thin sheet paper to prevent movement inside the box acting as extra padding. 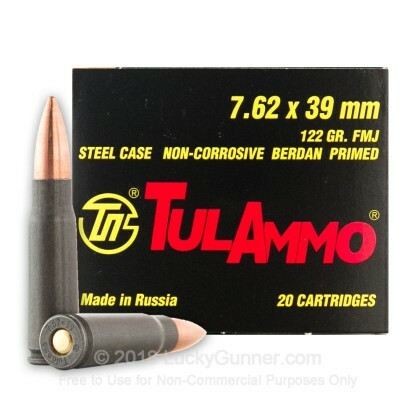 Tula also offers this ammo in cans of 640 rounds. These cans are great for long term storage. A: If you add the item to your cart, you will be able to enter your ZIP code in the shipping calculator for an estimate.